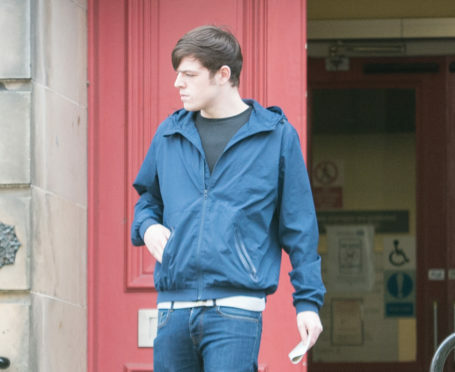 Reece Black is pictured leaving Elgin Sheriff Court. A teenager who took MDMA to a house party has admitted giving the drug out – causing one man’s heart to stop beating. Reece Black had purchased £120 worth of the Class A substance for himself, but ended up sharing with some of the guests at the Forres gathering. Elgin Sheriff Court heard that one of the party-goers – a 50-year-old man – had asked for some of the MDMA in exchange for an acid tab. 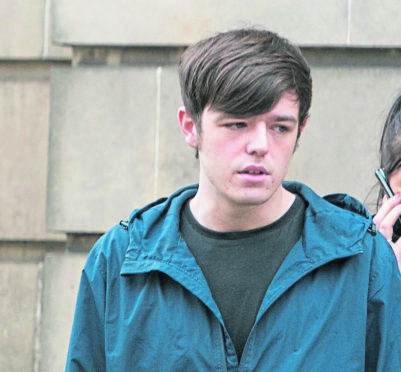 Black, 18, refused but was gave the man some MDMA anyway, which he swallowed down with some alcohol. But the man – who had taken five acid tabs already that night – quickly took ill, and lost consciousness. Fiscal Alex Swain told the court: “While the party continued after the man consumed the MDMA, at some point he was sleeping and a witness called an ambulance after he lost consciousness. “At 1.20am, police attended the property after receiving noisy music complaints. “They found the man unconscious in an armchair and put him in a recovery position before discovering he was no longer breathing. Officers searched everyone at the party and Black put the last of his MDMA in a cigarette paper and handed it over. The incident happened on January 5 this year, when Black was still 17. Defence solicitor Matthew O’Neill said his client realised the seriousness of the matter, but insisted he had bought the drug for his own use. He said: “He was in possession of the drug to take it to self-medicate and that is alarming to see him take substances like that at the age of 17. “He received no commercial gain from the MDMA and because the guests at the party were not too familiar with him he allowed them to take it. Black, of Mount Dora Drive, Forres, pleaded guilty to supplying a controlled drug. Sheriff Olga Pasportnikov sentenced him to 180 hours of unpaid work to be done and put him on a 12-month supervision order. In this court report we described how a 50-year-old man’s heart stopped beating at a Forres party after he was given the drug MDMA, and he required CPR from police before being taken to hospital. We have been asked by the family of Gerard Mcarthur to clarify that he died several days later after they agreed to his life-support machine being switched off. This had not been revealed in court.